Huh? Not really. That is exactly what I was pointing out prior to the season. Rodgers has always under-utilized TEs. For that reason, Graham was one of the players I had scratched off my draft list . Yeah but he’s not had a RZ weapon like Graham for a long time at the position. Everything coming out of GB was that he’d be a big part of their RZ O. For him to have Just FIVE RZ receptions all year is mind blowing. Criminal misuse. if you foresaw that in 2018 I tip my hat to you. And ask you for this weeks lottery numbers. It was easy to see, Rodgers has never used TEs no matter how good or bad they are. Every FA TE that signed with GB saw their production decline significantly from what they had in previous teams. The only #1 TEs that had been signed by GB in the Rodgers era were Cook and Bennett, really, before Graham. Cook was injured early in his only season, but had a strong second half. In his 7 regular season games after returning from injury, and 3 playoff games, he averaged 55.3 yards and .3 TDs per game (expanded to fit a 16 game season would be 884 yards and 4.8 TDs). Bennett had apparently failed to disclose an injury to the team, which ultimately wound up with him getting cut (oh, and also there's the whole Aaron Rodgers being injured for most of the season thing). Before them, Jermichael Finley (excluding his rookie season as he was brought in slowly) was averaging 50 yards and .35 TDs per game (which would be 800 yards and 5.6 TDs for a 16 game season) before his career-ending injury. Also, on the topic of redzone production from TEs, the year before Cook was brought in, Richard Rodgers caught 8 TD passes. Evans and Cook are both potential high-upside plays, but both have greater question marks going into this week than the other options. Evans just has not been clicking with Fitz lately and Cook is only in his second game back from injury against a great defense. Almost picked up lamar Jackson this morning. Been running 1 qb with Aarons Rodgers all year so I didnt. Might have to use the waiver on him. Looks like his hot start didn't produce much. Well **** me. My team has been overall decent, but just kept losing despite how well it played. This was my week to start catching up on the W/L board, but my team has really **** the bed. Carson Wentz, Marquez Valdes-Scantling, Trey Burton, and Dalvin Cook have combined for less than 2 points. Still a quarter for Burton and Cook to turn it around. Edit: So much for turning it around. Cook just managed to run backwards in the 4th quarter. Those 4 players combined for a total of 1.5 points for me. Christ that’s the baddest of bad luck scenarios. Sorry man. Feel for ya’. That one must REALLY smart. I never realised Flacco was out or else I’d have benched John Brown. (3.30 total points off ONE target.). Kicking myself for not double checking for once before Sundays games. Currently down 13.78. He’s all played up. I have Josh Reynolds still in play so hoping the Rams work him quickly in to save the day in Kupps absence. Ebron, who leads the NFL in TD receptions, dropped a nothingburger. Luck put up 300 & 3 TDs, and Ebron didn't get a single catch. Unless Goff puts up 35, this week will be my lowest score in five years in the ES league. Wentz with a 0.84 this week for me. Lovely. Need to start 2rbs, 2wrs, 1te, 1 flex from these next week (starting Thursday). Any tips? 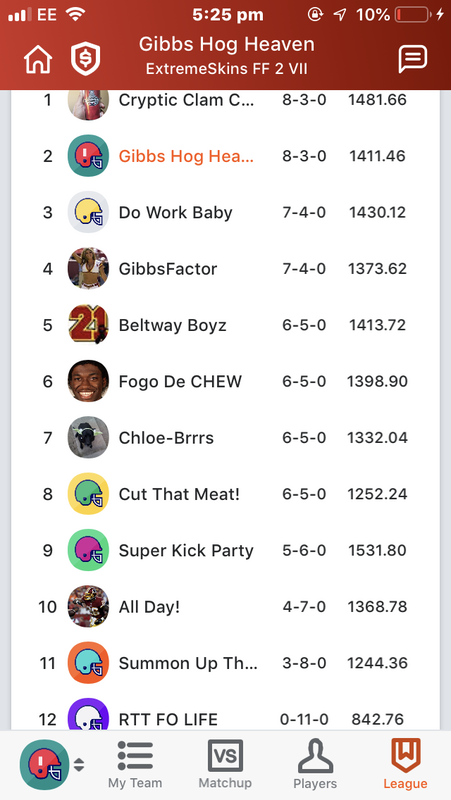 I'm 6 and 5 now (or will be after tonight) and need to win at least 1 of the last 2 to sqeak into the playoffs. Karma for last weeks disgrace from him! My initial thought was Ingram and Chubb, Boyd and eh, Hilton I guess. The second receiver is tough. I was looking real good but then the king of garbage time Cousins and Diggs lit it up late. Now I'm down 34 heading into MNF. Thankfully I have Kelce, Hill, and Butker, so I'm still confident I can win. So umm... I actually won this week despite a QB, RB, WR, and TE combining for 1.5 points. Tyreek Hill, Aaron Jones, and Kareem hunt came to play. I presume other peoples Yahoo leagues haven’t updated the correct total scores after last night and have put out a wrong new table? I won the game but it’s got the final minus the 20 points from last night that won me this weeks contest. (Although madly it’s credited the relevemt player.). And thus the table has me 7-4 rather than 8-3. Yep although it's corrected now in our Yahoo league. Going down to the wire for me. Two games left and top 6 make the playoffs. I'm at...6....but only because of 6 points more scored...for the year. Corrected now in ours too. Your league has been much higher scoring than ours. Hope you get in. Good luck! So Reynolds had an immediate payoff after picking him up as soon as Kupp went down last week notching 20 points for the come-from-behind win. Two game losing slump halted. 8-3. 8 W’s down. 5 to go! 1 win from the last three might be enough for the paloffs. ^^^ 1) Fogo De Chew. What a clever name, hats off to that guy for such creativity. 2. Why is he so handsome? I bet it's the Soul Glo. To compensate for how bad he is at fantasy?